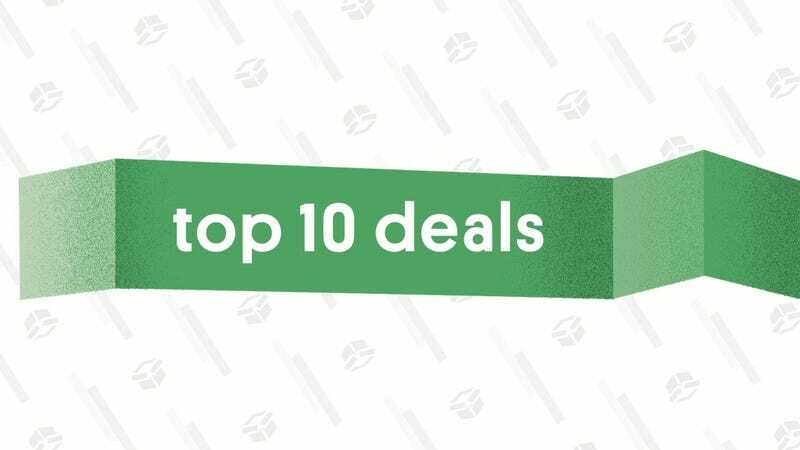 Amazon’s 12 Days of Deals have arrived at PC day, and the most wide-ranging sale of the bunch includes everything from networking gear, to external hard drives, to flash drives, to actual components you could use to build or upgrade your PC. A few of our favorite deals include the basic-but-fast Archer C1200 router for $40, a 2TB portable hard drive for $48, an ultra-fast cable model for $79 (a must-buy if you’re still paying for one from your ISP), and a GTX 1060 graphics card for just $229. There are dozens of other deals included in the sale though, so you’ll want to head over to Amazon before they sell out. Today, Amazon is blowing out a number of Logitech accessories for work and play. If you’re looking to upgrade your home office setup, notable deals include the $30 Logitech MK545 and $130 MX900 wireless keyboard and mouse combos. (The latter set features an exclusive all-black version of my favorite mouse, the MX Master.) Both sets are an all-time low. Gamers, too, can get in on the fun with Logitech’s G-Series gaming headsets and an entry-level starter set for $80, or $20 off a similar bundle offered by Razer during Black Friday. There are a lot of reasons to own a Raspberry Pi, but anecdotally, I think somewhere north of 90% of people buy them to build retro game consoles. If anyone on your shopping list loves to tinker Amazon’s running a couple of great starter kits today. $58 gets you a kit with a Pi 3 Model B, but you should probably spend $6 extra to upgrade to the faster B+, in addition to a faster microSD card. Both kits include all the basics, including a case, storage, and a power supply, so your giftee can start building cool projects from Day 1. Just note that both deals are only available today. Bryker Hyde’s Quick Draw was one of the first Kickstarter wallets that we really fell in love with over here. Its key innovation was completely eliminating the bulk-adding cash pocket and replacing it with a metal money clip at the fold, but everything about the wallet from its leather to its stitching is top notch. Nearly a year later, you can now buy the wallet on Amazon, and our readers can get it for just $21 with promo code Kinjadeal30. That code will work on any color, on both the ID-inside and ID-outside versions. Needless to say, these would make great stocking stuffers for anyone that needs to slim down their wallet…without slimming down yours…because it’s $21. I know this thing is called a Camp Cup, but Miir’s popular drinking vessel will be your favorite mug whether you’re using it in the woods, at home, or in the office. The MiiR Camp Cup stays true to the classic form factor, while adding a generously-sized handle, snap-on sip-through lid, double wall vacuum insulation, and medical grade stainless steel construction that won’t sweat, burn you, or transfer flavor. Every color is about 30% off right now (black and white are always cheaper than the more fun designs), and our exclusive 15KINJADEAL promo code will save you an extra 15% at checkout. That brings the cheapest ones down to $15, which is right in stocking stuffer territory. MiiR Insulated Camp Cup, Black, 12 Oz. Star Wars Storyboards is a gift that will send any true Star Wars fan over the moon (or not-a-moon), and at $21, it’s within a few cents of its best price ever. The book includes 352 pages of original storyboards and notes from the original trilogy, including never-before-published art from deleted or never-filmed scenes. For more art book inspiration, check out our roundup over on The Inventory. Each Duo Glass is hand-blown, and has subtle 1 oz. measurement lines integrated into the design, so you can pour a perfect shot or measure a simple cocktail without dirtying up any other dishes. The best part though? They come with their own sphere ice molds that are designed to nestle perfectly at the bottom of the glass. How…cool is that? There are two kinds of people when it comes to receiving tools as a gift. Some would be at best disappointed and at worst devastated to open something like the Black + Decker 75-Piece 20-Volt MAX Project Kit on Christmas morning. Then there are those who would love nothing more than a SKIL 15-Amp 7.25″ Circular Saw or Campbell Hausfeld 3-Gallon Inflation and Fastening Compressor with Accessory Kit. If you’re shopping for the latter type, these Walmart deals are pretty solid for mid-range tools. And there’s also a Stanley 167-Piece Home Repair Mixed Tool Set for $25, which may not be glamorous but sure would be handy for a newly keyed homeowner or young adult just leaving the nest. It’s up to you to determine whether the gift recipients in your life would be delighted or distressed to get these items; may the odds be ever in your favor.